When Lt. Joey McCarthy, of the Lamar County Sheriff’s Office, saw a trailer mounted smoker in the county impound lot, he saw potential. McCarthy’s goal was to have a smoker that the sheriff’s office could use to help build positive interaction between the community and their department. By seeking assistance from Ag Science Instructor, Steve Tucker at Paris High School, students could be a part of the community building project. 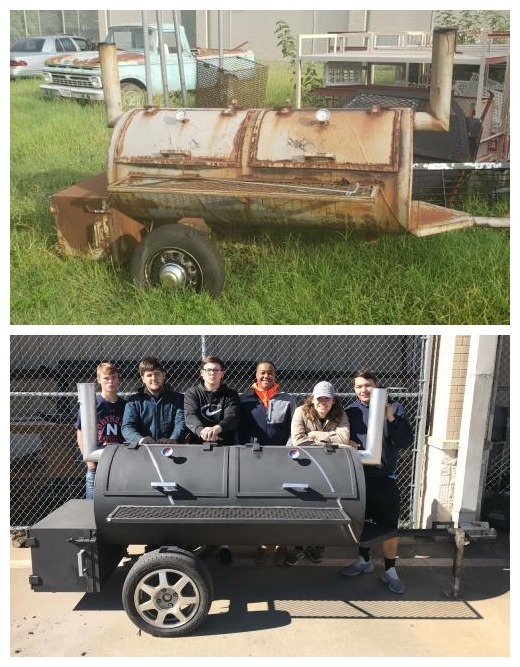 Tucker’s Ag Mechanics class took on the rehabilitation starting with cleaning out the smoker that had previously been used to burn paper. Once the smoker was cleaned, the class worked to remove rust, repair the cooking racks and firebox, and repair loose welds. After painting the unit, the students installed new wheels and tires on the trailer. This collaborative effort between PHS and the sheriff’s office will benefit the community. The students had the opportunity to apply their skills to a worthy project and the Lamar County Sheriff’s Office receives a tool they can use to expand their outreach in the county. Shown with the refurbished smoker are PHS students (L to R) Walker Preston, Skyler Toland, Ryan House, project leader Ashton Milton, Garrett Rowton, and Christian Barrios.